Yes. Yes! The Mira Grant ‘Newsflesh’ series continues, even though we all probably thought we’d spent the last of our time in the Kellis-Amberlee infested earth. Author Mira (Seanan McGuire) Grant brings us back to the exciting, frightening time when the dead rise and walk and feed, and the living get their news instantly from a group of in-field reporters and Irwins (so named for Steve Irwin) who live dangerously among the zombies in order to get the news. But for fans of the first series, be forewarned that all the favorite characters (the Masons, Buffy, Ryman, etc) are not here except as reference points to let us know where and when this story is taking place. Feedback occurs at the same time as the first set of books, with a different group of reporters and Irwins following a different candidate for President. Grant tries to recreate the magic with this new group and there are an awful lot of similarities, making it appear as though, to be an Irwin or reporter, you have to be cut from the same cloth. Fortunately, there are just enough differences to keep this interesting. Here we have Irish woman Aislinn (called “Ash”) (‘Irwin’), who married Ben (‘Newsie’) in order to come live and work in the U.S., but she’s lesbian and her lover is Audrey (the ‘fictional’), and there’s Mat, the techie who is also a make-up expert. We meet them as they are starting to work as the embedded news team for Governor Susan Kilburn who has declared her candidacy for President of the United States. But a series of zombie attacks on the Kilburn compound quickly suggest that someone, somewhere, is trying to derail the Kilburn campaign. Ash and team got more than they bargained for. Fans of the series and of Grant’s work will be thrilled with this and because it doesn’t rely on knowing what happened in the first set of books, it is a good introduction to the world for new readers. While it has been awhile since I read Feed I remember that the it was a beautiful blend of story and action. Feedback doesn’t blend quite as nicely. This book feels like pure zombie action in the first half – with attack after attack – and just enough story to give us a little background and foreshadowing. And then the book digs into the story. In fact, this feels like a different book altogether in the last quarter. The majority of the book is a set-up and introductions and does have a conclusion (of sorts), but it’s clear that this is the beginning of another story. Because Ash and her team are reporters and interested in the Presidential race, they do comment from time to time on what is happening to the Masons, reminding us that this story is happening concurrently with the events in the first three books. This is fun for those of us familiar with the original story, and good history for the new readers. Ash and team aren’t quite as interesting as the Masons, but the stakes are still high and we see that the life of an Irwin and the pursuit of knowledge and truth is extremely dangerous. Ash’s history (and future) may not be as complex as Georgia Mason’s, but it is also filled with conflict and intrigue and we get a sense that what is happening to humanity during this ‘Uprising’ is so much larger even than what we learned from Feed, Deadline, and Blackout. It becomes more terrifying because of this – which has the odd effect then of making what happens near the end of this book seem quite unimportant. Even though this book didn’t quite have the impact that the earlier stories did, it’s still a well-written and thrilling tale and should be enjoyed by fans of the series and a great way to draw new readers into Grant’s zombie world. Looking for a good book? 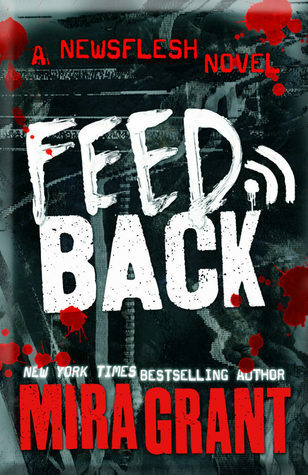 Feedback, by Mira Grant, is a return to the Newsflesh series, following a new band of reporters during the Presidential election campaign. Fans of the series, fans of zombie stories, fans of goo fantasy writing won’t want to miss this.